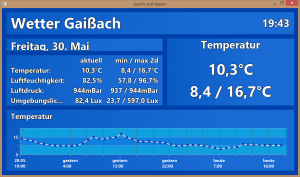 The third and last post of this series describes the RasperryPi that is connected to the TV and displays the sensor data in a visually appealing way. 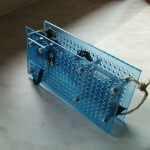 In the past blog post, the first Raspberry Pi was connected to several sensors. Tiny Python scripts poll the data from the sensors regularly and save them to simple text files that can be copied via SSH/SCP. Current data can be obtained from the sensors by directly connecting to the Brick Daemon which runs on this RasPi. The most important question first: What do I want to see and do? I had a pretty clear intention already: I want to see the current values of all sensors in a small overview and I want to be able to toggle through time series of the past days. Toggling should be done by the TV’s remote control as I would have the remote at hand already when I switch to the Weather data display. I’ve seen several guides where an IR-receiver and an additional remote were used to control the RasPi. Yet I simply do not like the idea of having another remote control on the table – right next to the other ones. Also controlling the app via mobile phone wasn’t what I wanted as we usually still simply use the TV’s own remote to control the TV. – Also I know from Raspbmc that it is possible to accomplish this by using libCEC – somehow. Next question to clarify: How should the data be visualized on the TV. This was easy: JavaFX. I wanted to control the UI with the TV’s remote control. That has to be done somehow using the CEC-commands that are sent through HDMI. I’ve never done that before and anticipated my chances to accomplish this in pure Java ways higher than somehow creating input events that I had to redirect to the browser. Prior to coding, I did some research if and how the CEC commands are sent through HDMI. And – unfortunately – besides all software problems, a lot of people reported problems to even get the signal to the RasPi! Possible problems mentioned throughout several posts included the TV software having disabled the CEC functionality or HDMI cables that were blocking / not forwarding the CEC signals. What I found the easiest way to test the CEC compatibility of the setup was Raspbmc. Raspbmc is a mediacenter for Raspberry Pis, which is easy to install and supports CEC. So: download the image, flash it to an SD card, connect the Pi to your TV with the HDMI cable that you want to use later as well and start the Pi. If you see your TV’s remote working: Great! Otherwise: you have my sympathy. Good luck in finding out what is wrong with your technical setup. 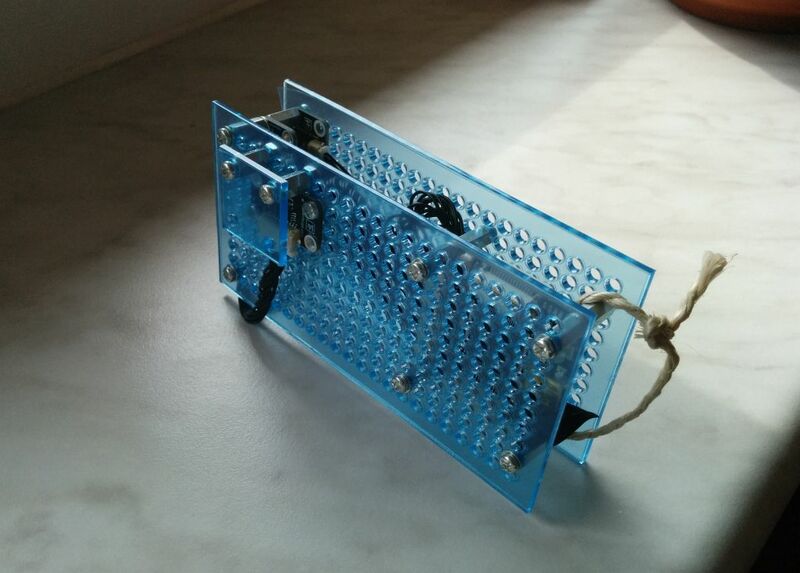 So the CEC signals are technically consumable by the Pi. Let’s istall libCEC. LibCEC is now installed including cec-client (seen in the last call). Play around a bit with cec-client. Up to now everything was fine on our Samsung TV. But beware, I’ve seen posts where people with TVs from other vendors faced serious problems … If you want to play around with cec-client, CEC-O-MATIC might also be a reference you should have a look at. java and javac should link to 1.8.0 now. Note that the default configuration of JavaFX on the Raspberry Pi does not use X11. Instead JavaFX works directly with the display framebuffer and input devices. So you should not have the X11 desktop running when starting JavaFX. JDK 8 EA builds for the Raspberry Pi include full support for hardware accelerated graphics, with everything from the base, graphics, controls and FXML modules. Media and Web modules are not included. So configure the Pi to boot just to the shell (via sudo raspi-config) and do not try to see the JavaFX output via VNC! Before I even started to code, I wanted to set up the layout. Coming from a Java-Swing background I was really excited to try this JavaFX thingy that was said to be so much cooler than Swing. After setting up the project in NetBeans and installing JavaFX Scene Builder I was very positively surprised! By the way, I was only working with Scene Builder 1.1, the current Version 2 is said to be even better. After initializing the project, my focus quickly went into the src/main/resources folder. At this location you can find fxml/FXMLDocument.fxml and styles/base.css (later renamed to metro.fxml/.css). Designing the Gui was about 90% done just in Scene Builder (for the .fxml) and Netbeans (for the.css). The really really nice thing is that it is a true WYSIWYG editor. Also whenever the css file is being edited, the effect is immediately visible in Scene Builder. Simply great compared to what I was used to from my Swing experience. After the main layouting was done, I started to write some Java code in FXMLDocumentController.java. Accessing UI components is simply done by annotating the according fields. The fields themselves are injected automatically. A nice decoupling of view and controller. Also I was able to compare two very different layouts by just switching one single line (the one referencing the fxml file) without further refactoring. Time for some user tests! Honestly, I was a bit afraid what others would say. But I wanted to make a NICE UI, so I asked my wife and friends on Facebook and Google+ for feedback. And this decision turned out to be damn right! I got very valuable feedback about colors and layout. I definately recommend asking users – and value their feedback! Afterwards I implemented the logic for reading the CSV files including filling the model classes. These model classes were then rendered into the graphs. So I also had some test data and continued styling the graph lines via CSS. At this stage I remembered the talks of Gerrit Grunwald. Gerrit is pretty experienced in JavaFX on the Pi and mentioned in some talks that animations on the Pi can be really really slow in the beginning until everything gets hot spot compiled. – I can definitely confirm this! The trick was to simply set animated="false" on the line chart that would only be animated at the beginning (which I didn’t really need or want anyways). Time for a first test on the TV! At this point, remember the last part from “Install Java8” above: We do not need an X-server as JavaFX on the Pi paints directly to the framebuffer! 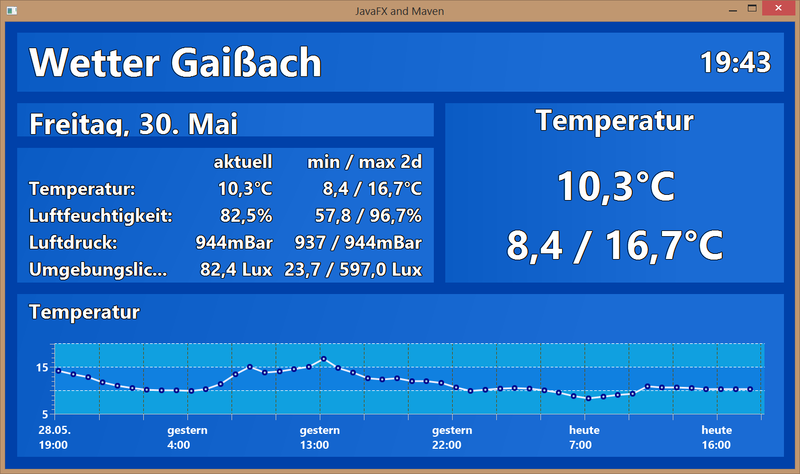 So just compile and build the Jar, copy it over to the Pi and start it with java -jar ./ Weatherstation-1.0-SNAPSHOT.jar. I made the experience that my regular monitor is not the same as the display of the TV. So I spent some time with adjusting css font sizes until I was content with the way everything was displayed on the TV. It feels a bit like webdesign and testing with different browsers – just a bit less painful. With the gui being done so far, the next step had to be done. When the program is started, archived data is read from files. Current data should be fetched directly from the remote sensors. This was actually plain easy. With the API provided by tinkerforge, everything I had to do was starting a thread off the Event dispatching thread that polled new sensor values periodically and pushed the data to the models. the models then simply updated their UI elements. The key strokes should be used to toggle through the values of humidity, temperature, ambient light and air pressure. /usr/local/bin/cec-client -d 8 -t prta -o Wetter. The d parameter defines the verbosity of the output, t defines the type of device the cec-client simulates (recorder, …), and o finally defines the string that is shown in the On Screen Display of the TV when brwosing through the HDMI input devices. When a cec-client listens with this command, just switch the TV to the according “device” and press some buttons on the remote control. The key presses are shown on the console. The console output again is parsed directly from the Java process and calls the appropriate methods in the controller. This works brilliant in my case. Yet PulseEight do not recommend using cec-client in a production environment as it is intended for tests only. But well – I didn’t want to invest even more time into coding a perfect cec-java-bridge. Especially as my C-knowledge is very basic. So chances are high that my implementation would be far from “production ready”, too. That’s it! And of course, you can fork the complete project on GitHub! For quite some time I’ve been playing with the thought about bying a Raspberry Pi. Yet the biggest issue was: I had no use case for it! I always liked information about the weather – especiallly I wanted to know in the morning how cold it was at night etc. So the use case was found: a weather station! Yet I was pretty distracted from all examples that I found on the web as I wanted a visually appealing UI so that it is fun to look at the data. Usually the samples just controlled a small LED display to display some values but – honestly – I don’t need a display at the weatherstation directly – I mean – shouldn’t it be somewhere outside and not in the room?